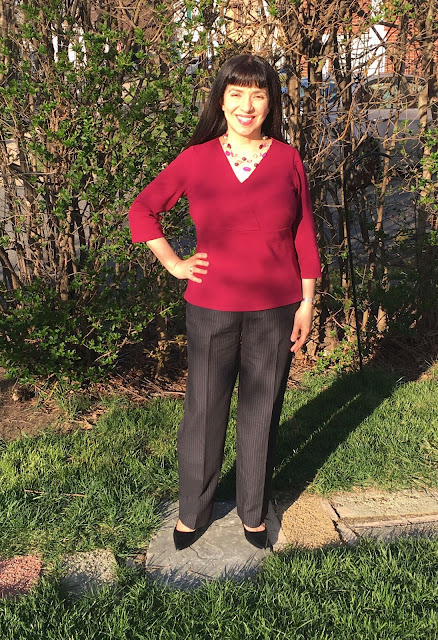 Throughout the years, I have tried many different methods of pant fitting in an attempt to make pants that fit me nicely. I have taken many online classes. I have gone to seminars. I have taken every pant fitting class offered at the sewing expos I have attended. Each class deepened my understanding of pant fitting and why pants don't fit me well. 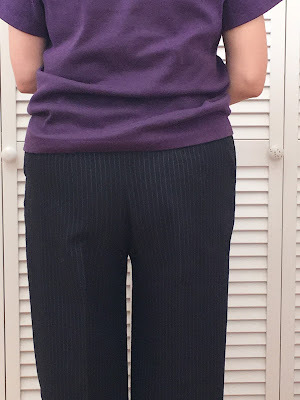 Despite all my efforts, I could not make pants that fit me properly. My problem is that I have too much fabric below the derriere. There have been times where I got so exasperated that I just put the whole thing aside and picked it up much later. By far the method that worked best for me was a pant fitting class offered some time ago by the NJ Chapter of the ASDP (Association of Sewing and Design Professionals) taught by Karen Bengtson (member of the Colorado Chapter). 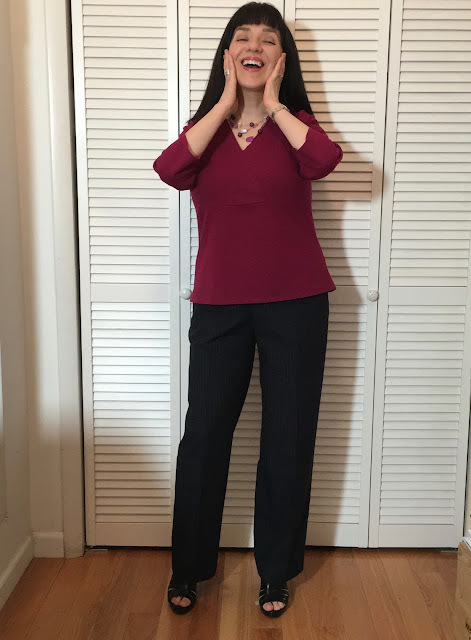 Karen based her techniques on the Joyce Murphy method of pants fitting using Joyce Murphy's pant block. Karen had a "test pant" of each size of the pant block. She had us try on the test pant that came closest to our size and then "draped" them on us. She took it in here and there until she was satisfied with the resulting fit. She measured the adjustments and had us record them. We then traced Joyce Murphy's pant block and transferred the recorded adjustments to the pattern we had traced. We then cut the pants out in fabric and sewed them. It was a 3 day class well worth the time and effort. Goodness - they had a nice fit! Just a little bit of wrinkling below the derriere on the left (my left hip is lower) but it doesn't bother me at all. Woo hoo! And now I am a happy camper! Joyce Murphy's pant block uses a European cut. I notice that the pattern has a different crotch shape and different crotch lengths for the front and back pattern pieces than do the Big 4. For my next post, I am going to explore why I think her pant block worked for me. 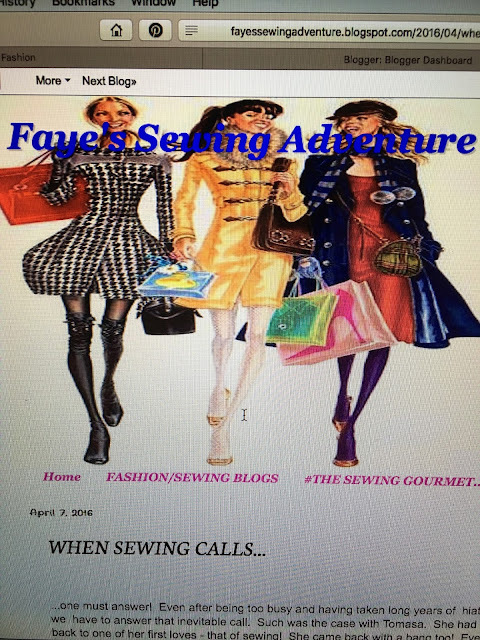 I feel so honored and flattered that Faye from Faye's Sewing Adventure has featured me on her wonderful blog. Faye currently has a fun interview series going on and I am so excited to have been selected. You can check out the interview here. While you are there, be sure to check out the interviews she has done of some fun and inspiring bloggers. It is so gracious of her to do this for her fellow bloggers.